The choice of your lipstick color has a significant impact on your look: can enhance your natural features and can be the finishing touch to your look. The right choice of lipstick color can intensify the color of your eyes, amplify your best features and improve your beauty while boosting your mood instantly. Also, a woman with well-defined lips and a lipstick color that harmonizes with her complexion and outfit gives her an elegant allure drawing attention toward her immediately. If you choose muted colors for your outfits such as blue navy, grey, and black than you have more freedom with your lipstick color. For example, if you wear a pair of dark jeans with a black top, you can spice up your look with a bright lipstick while keeping your facial features played down with soft eye shadows makeup or showcase smokey eyes for a bold approach. Don’t be afraid to match your lipstick with your dress. Pairing any lipstick color with a dress gives a polish and elegant finishing touch. However, matching a plain dress with a matte red lipstick may appear dull. It’s important to take into consideration the texture of the lipstick and choosing a glossy finish will bring up a pop of color to the entire look. Consider adopting a lipstick color that can pair with one color of your accessories such as shoes, purse, belt. For example, if you carry a red bag than you can find a complimentary red shade for your lips. 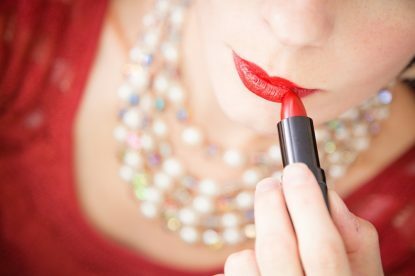 Consider lipstick as a stylish accessory and make the color of your lipstick to emphasize or to contrast the mood of your outfits.